I am so excited for y’all to meet Ingrid! You might remember seeing her twins' cake smash (with a few appearances from big sister). I came across her blog after doing their session and I was blown away. You see, Ingrid and her husband's path to their sweet children wasn't an easy one. Moreover, she is so open and honest about the trials and tribulations of their journey to show other couples they are not alone. I asked her if she would share a little of her story and she graciously accepted! What is your biggest accomplishment as a mom? My biggest accomplishment as a mom has been the blood, sweat, and tears it took to complete our family. I had no idea what it would take and the perseverance I had inside of me. Our first baby, Anna, came miraculously after 10 months of tests trying to figure out the extreme pelvic pain I was experiencing for years. One week before my scheduled laparscopic surgery I found out I was pregnant with our daughter. After my C-section with her I apparently had an unknown infection that lead to the development of pelvic adhesions and scar tissue. I didn’t know about them until two years later when I had my first laparoscopic surgery to remove some large cysts. 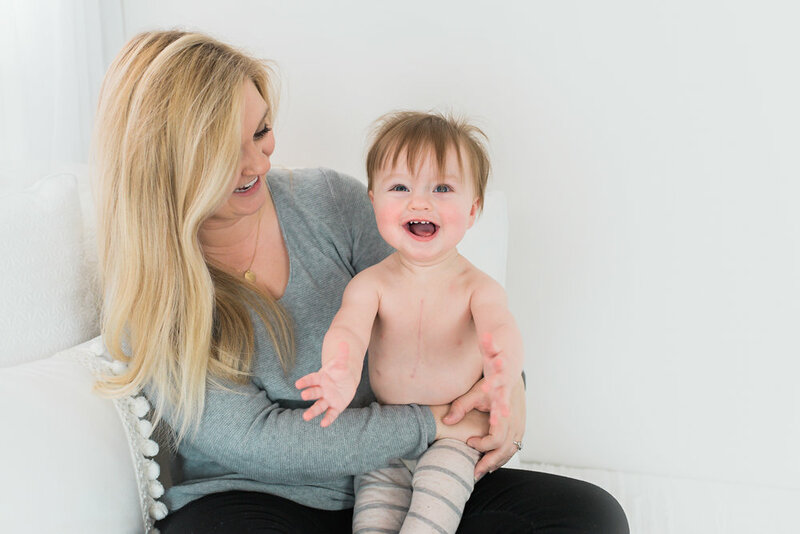 Once the doctor began the operation she quickly saw my tubes were completely damaged by scar tissue and my ovaries were completely covered in scar tissue that couldn’t be removed because we wanted more kids and it could’ve damaged the ovaries forever. So I awoke to the news that IVF would probably be our only option to have more kids. As soon as I heard this I had a faith in my heart to give IVF our best shot to expand our family. I knew if we didn’t try I would regret it forever. A few months later we began a 7 month rollercoaster to get our twin boys which included one failed round and an ectopic pregnancy. During that time we cried a lot but we also grew closer as a family and I wouldn’t change a thing. I had no idea I had the strength in me to endure 3 rounds of hormone shots, procedures, and the hardest thing of all, waiting for the results. But I remember the first time I saw two little sacs on the ultrasound screen and the relief we felt knowing all of our hard work paid off. We got the 3 kids that we always dreamed of. That feeling will stick with me forever! My biggest hope for my children is that they grow up to make this world a better place. I want them to be positive contributors to our society. We hope to raise them in a way that calls out their full potential and cultivates their God-given gifts. This is always my favorite question to ask moms because I feel like we are all in this together and sometimes, you just need to laugh. What is the funniest moment you’ve had recently as a mother? Being a twin mom and mom of three is the most chaotic thing I’ve ever been a part of. Twin 13 month olds are so messy. Sometimes it is hard to clean the mess up right away. After the boys eat (throwing most of it on the splat mat) we usually move right on to the next activity. There have been several times I’ve gone to the kitchen to clean something and I noticed they went back to the mat and are eating off the floor. Sometimes I just ride the wave of chaos and let them keep eating their second lunch. Celebrating our twins' first birthday was such a sweet moment for us after the heartache it took to get them and I’m so glad we have it all in pictures to remember. We will cherish them forever. Y’all, if you could have been a fly on the wall during this smash. Finn was all about his cake. He was quiet and content. He was focused on the task at hand – making sure he got every part of his cake. Larson, on the other hand, was the life of the party. Eating cake? Nah! Making everyone laugh by turning his cake into a slip and slide? Heck yeah! I’m so lucky to get to work with families like this one and I am so grateful that Ingrid is so open and honest about their journey to three beautiful children. You can read more of her story here.